1. That it will become possible to “pin” Metro apps to the taskbar on the desktop, and run those apps within Windows on that selfsame desktop. This will probably irk the folks at Stardock, who offer this capability in the form of a $5 desktop application called ModernMix, but should be welcome news to those who spend most of their time in Windows on the desktop, with only occasional forays into Metro app-land. 2. MS also intends to reduce the disk and memory footprint for Windows 8.1, so that it will be better suited to reside on el-cheapo tablets, which seldom include more than 2 GB of RAM nor more than 32 GB of flash memory for storage. Right now, for example, my brand-new Fujitsu Q704 tablet running Windows 8.1 occupies 29.2 GB on its SSD (basic Windows 8.1 Pro installation plus MS Office 2013 Professional Plus, and less than two dozen other apps as detailed in my blog from last Friday entitled “Getting Desktops Ready for Windows 8(. *)“) and consumes 2.02 GB of RAM (running the OS, Task Manager, Desktop Gadgets, and PowerShell). I can see where MS would probably like to trim the bare OS below 20 GB and memory to 1.5 GB (or less) to give less well-endowed tablets some room to breathe. 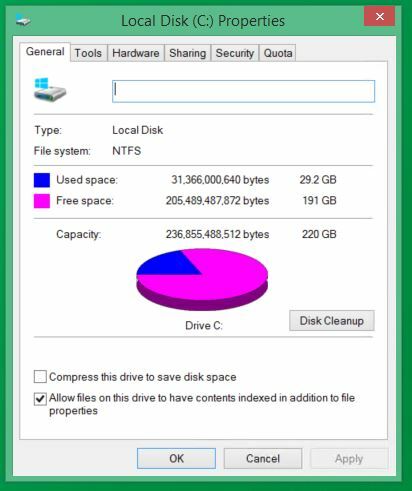 Just with Windows 8.1, MS Office 2013, and a scant set of other apps, my disk footprint is already over 29 GB. I wonder exactly how MS will accomplish the latter trick. My best guess would be some kind of special parameters to more aggressively manage active runtime elements, perhaps by reducing the number of services running, and background processes called into action during typical use. If true, it should be interesting to examine how Microsoft tweaks things so as to provide some guidance on how admins and power users might themselves do likewise if the setting is neither ubiquitous for all Windows 8.1 installations, or not directly available to informed users who’d like to reduce the Windows footprint on other machines as well. And in fact, I hope Microsoft is looking at sites like the excellent Black Viper (whose tag line reads “Have you tweaked your OS lately?”), to get some insight on what can stay, what must go, and what could go safely if what must go is not enough by itself to trim things down as needed. 3. Paul Thurrott “Need to Know: Windows 8.1 Update 1 and Windows Phone 8.1” WindowsITPro (1/28/2014) Thurrott indicates further that “…this disk savings will only be offered on new PCs, and isn’t something that can be added otherwise.” Bummer!